The rock cores from hole U1365E are now being brought up to the core deck from the refrigerated room below. They have been in "storage" so that the microbiologists could choose the portions of the core that they need. In the photo, you can see a fracture filled with mineral material, most likely calcite. 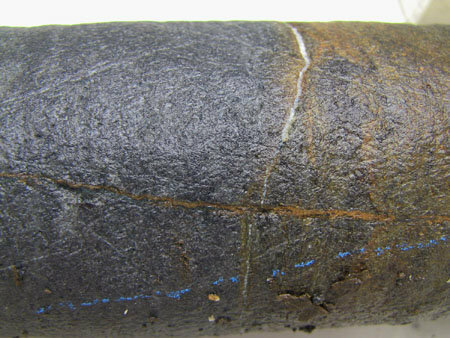 You should also notice another fracture cutting across the first and some discoloration due to the oxidation of iron. These are the types of things that the scientists are noticing. These are called whole rounds because they have not been split yet. They are scrutinized by one of the petrologists for interesting features and then the petrologist marks the core to indicate how it should be sliced into two halves in the splitting room. The idea is to make sure both halves of the core, the archieved half and the working half, exhibit the features. After splitting, detailed descriptions are made of the entire core and entered into the database. The core is often not in one unbroken piece, so scientists must painstakingly try to match up pieces as best as they can. Some additional photos can be seen below.